Zoosk is a leading online dating website that “learns as you click” to match you with singles you’re likely to hit it off with. 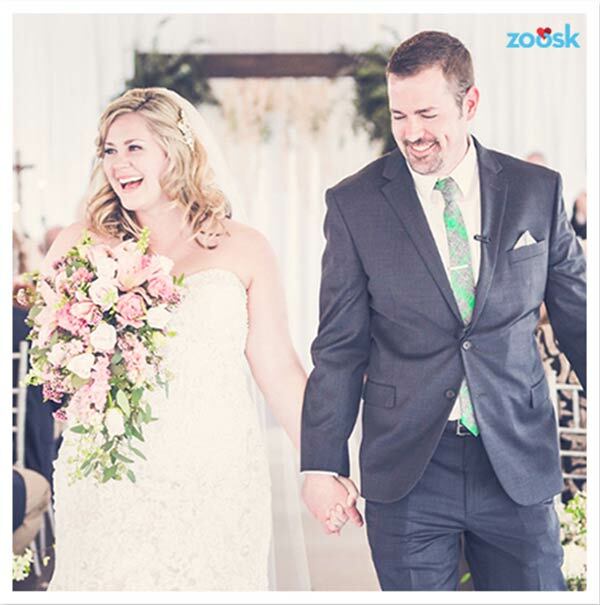 With over 27 million active members, you won’t find many dating sites in Canada with a larger user base than Zoosk, and yet the site succeeds in meeting the needs of each individual user. It does this by leveraging smart matchmaking technologies and interactive tools to communicate with other singles. Zoosk also puts a large emphasis on experience, in fact, it has a #1 grossing dating app on the Apple Store. SmartPick asks you to “heart” or “X” user profiles, and learns who you would like based on your answers. Interactive communication tools such as “winks,” “flirts,” online gifts, emails, instant messages, photos and videos. A “Profile Carousel” for navigating between profiles in a fun and playful way. Daily emails with 3-7 fine-tuned suggested matches—what a time saver! Zoosk coins can be purchased by paid and non-paid users to Boost their profiles, unlock carousel matches and buy gifts for other singles. Premium Messaging allows non-subscribed members to respond to you, exposing you to 7 times more singles. Search by age, location, religion, social habits, lifestyle. You can sign up for Zoosk in under a minute. At any time, you can go back and spend more time filling out additional details about yourself if you want a more thorough profile and better search results. After the signup process, you’ll get a quick tour of the site and its main features. Then, you can start looking for matches immediately, or you can provide additional information about what you are looking for and add more photos to your profile (up to 6). If you’re not ready to become a paying user just yet, Zoosk offers a free trial so you can start browsing other singles in your area. To use matchmaking and messaging features however, you must become a paid subscriber. The site often modifies which features are available for free and which ones require an upgraded subscription. Make sure to stay tuned for special promo codes and discounts offered by Zoosk during promotional periods. 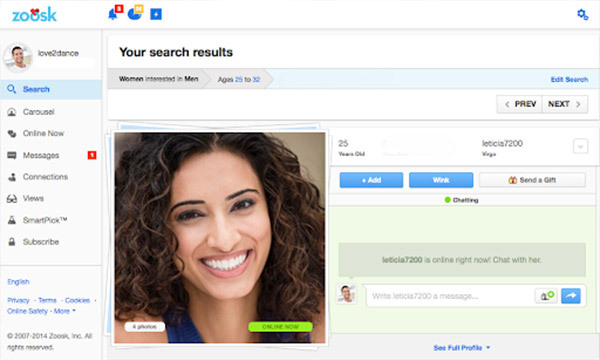 The Zoosk interface is modern, intuitive, and user-friendly, and provides a simple step-by-step guide for first-timers to practice browsing, viewing profiles, and messaging. 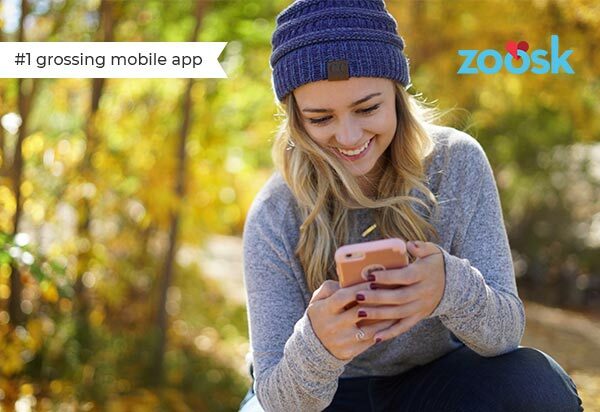 Aiming to bring the benefits of social media to online dating, Zoosk offers interactive instant messaging, much like all of your favorite social apps. Use emojis, GIFs, and virtual gifts to interact with singles in a familiar fashion. Zoosk allows users to submit a 7-second “selfie video” to verify that their featured photos resemble what they actually currently look like. This way, you can learn about single’s actual physical attributes from browsing through their profile. This is an excellent safety measure as other dating platforms are known to be host to users who feature photos that don’t exactly match what they look like in real life. 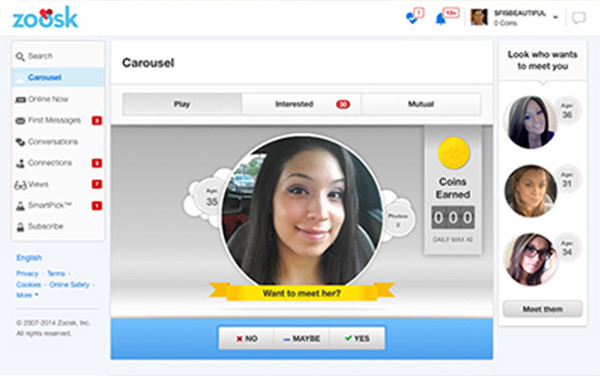 Another safety measure is taken by Zoosk staff members, who examine and conduct identity-checks on new users profiles. In addition, the “Private Browsing” option, keeps your personal information under lock and key. Is Zoosk Right for Me? Zoosk is one of the largest online dating sites, and knows just how important it is for singles to find someone who’s just the right fit. If you’re only getting started with online dating, this website is possibly the most straightforward way to do so—it is smart, safe, intuitive, and offers a free trial period.